The world wide web is a wonderful thing. You can find all sorts of stuff online: Forgotten childhood toys, free encylopedias, excellent entertainment to gawk at. The web is also a cursed place that spreads a lot of nasty. Any of you reading this, I’m sure you can relate. Some weeks ago I decided to drop all the bull and actually be nice for once, even online. It was a hard step to take as there were just way too many negativity creeping all over the place. In one YouTube channel I hang out, there is a comment there of someone advertising his own channel. This is a big no-no in the YouTube community, as it’s, just scrummy. You don’t do that. It’s rude. So the community piled on this guy, telling him off. Then I thought to myself, fine, let’s have a look. I checked his channel and, suffice to say, it lacked a few things. He even has a GoFundMe page asking for support so that he can improve his gear. I replied to his comment. Told him nicely not to promote stuff on other channels. Instead, just make decent comments and people can organically check his channel if they feel like it. Plus, there are reddit forums that support each other’s channels. I then told him about what cheap but good gear to buy to start with and other general suggestions on how to improve his videos. The comments after mine suddenly turned into a small support thread, where people started giving their own advise on how he could improve his channel. It was, simply put, amazing to see that unfold. So, the one thing I learned while browsing the net is that, one or two little positive comments can change the entire tone of certain situations. It can diffuse or worsen what’s happening. The bottom line is, keep calm and be polite and well, as cheesy as it sounds, can help make a slightly better world. Of course we’re all just being optimistic here. Seven is a good number, I think. It’s been a few days since my birthday. I had felt an obligation to post something, anything, substantial or otherwise. But nah, let’s flush that all down to the toilet. Let’s just say we’ve all grown a little wiser. The world is a not-so-bad place. But there are many swamps that will eat you alive. A little compassion and a little kindness can actually pull you out of the pile of filth that is happening everywhere. A few deeds to help others can go a long way. A few words of truth are harsh but necessary. I managed to pull my one of legs out of the existential crisis and learned to accept it as growth. And things appear to be running smoother. 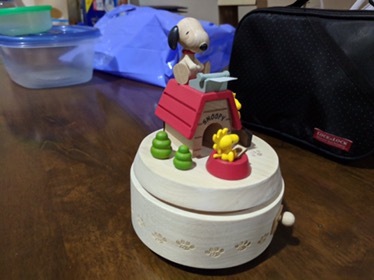 I got a charming Snoopy and Woodstock music box for my soon-to-be-born daughter. It’s handcrafted, polished, and windable. It plays the good ol’ Peanuts theme. It has Snoopy on top of his dog house, typing away on a typewriter. I hope my daughter loves it.